Fresh, clean nose with hints of citrus and boiled sweets. Light bodied. Complex, balanced palate with fresh clean raisin, fruit and an exceptionally soft finish. 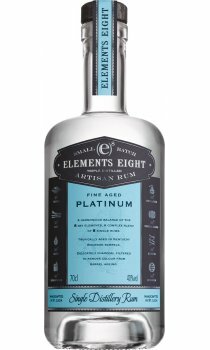 Elements Eight Platinum Rum is a versatile and super premium rum that will appeal to deluxe vodka, gin and white rum drinkers. The harmoniuos balance of the eight key elements renders this super premium platinum rum pure and flavourful. It can be enjoyed staight, on the rocks, or in one of your favourite long drinks or cocktails.